Some of the more eagle-eyed among you may be wondering where the usual European Nintendo Download Update details are; that's a good question, as we're thinking the same thing [Update, the full details are now live]. Nintendo hasn't sent out the press release to kick off the week, so we're working on the assumption it'll come later today or tomorrow. All is not lost, however, as a few releases have been confirmed by Nintendo of Europe on Twitter. 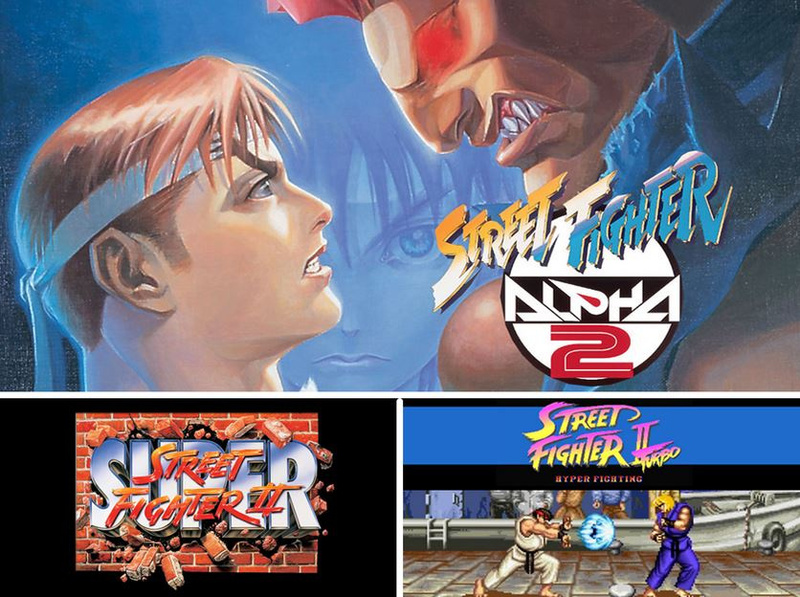 Three SNES Street Fighter titles are heading to the New Nintendo 3DS Virtual Console this week: Super Street Fighter II: The New Challengers, Street Fighter II' Turbo: Hyper Fighting and Street Fighter Alpha 2; they'll likely cost €7.99 each, though until 11th August if you buy two you can get a third free. We'll bring you the full download update line-up when it's released by Nintendo - in the meantime, are you planing to pick any of these up on 28th July? Good offer for 3DS owners. Couldn't they give give Wii U owners this offer as well? huh... are these all different or is there one better version I should get? @Achoo They are listed in this weeks European eShop downloads press release. @SLIGEACH_EIRE They had something like that in America, I think, when they released the three games the same day on Wii U. But it was 8 dollars each, the third for half that, so 4 dollars. 20 dollars for everything, opposed to normal 24 dollars, if there was no promo. Not sure if that happened in Europe too. I loved Street Fighter Alpha 2 on Sega Saturn! Good times. I just downloaded SSF4 3D Edition to my New 3DS yesterday funny enough. @plug313 I think alpha is sort of a subseries, not sure what the difference between the other two is. @plug313 Just get Super Street Fighter II. I fear for my 3DS buttons. But It is surely more than enough time Capcom would just offer us perfectly emulated CPS1 (and CPS2) versions by now, no? @Tsurii Mostly "Super" has 4 new playable characters: Fei Long, DJ, T. Hawk and Cammy. Which one is the ultimate version? I'll get one, no point getting all 3 if they are just better versions of previous games in the collection. Buy two, get the 3rd free. Will be buying all of these. They also say Europe will be getting TG16-games this week. @readyletsgo Street Fighter Alpha 2 has no relation to either Super Street Fighter 2 or Street Fighter 2 Turbo. It is it's own game. Super Street Fighter 2 has an additional 4 characters (Cammy, Fei Long, T.Hawk, DeeJay) as well as the ability to play as the 'grandmaster' characters (Balrog, Vega, Sagat, Bison) from the original iteration. Street Fighter 2 Turbo has a faster playing speed than the original iteration, meaning button inputs must be more precise if you want to use combos and special moves. Out of these two games, I would pick Super Street Fighter 2. I can't comment on Alpha, as it is an entirely different game, and I have never personally played it. I've been waiting forever for Street Fighter games to come out on the 3DS Virtual Console. I even topped up £40 in anticipation, so I know where it's going now. I would have gotten all 3 if there were a 2 player mode, but there isn't, so I will be keeping my money. Awesome loved streety 2 as a kid played it night n day I am pants now tho lol this year got back into fighting games enjoying street fighter 5 but do miss it on a Nintendo system. @ThomasBW84 In the second to last paragraph, August is misspelled. @MasterS7000 thanks for all of the information! The fact that they still attempt to make money on these versions is typical Nintendo/Capcom laziness akin to the exclusive gold Megaman amiibo (smash bros repaint). Capcom could have EASILY released these and a ton of other games in arcade-perfect form years ago via simple CPS emulators, and it would have been just as simple to add online play. They could have charged more for that and people would have accepted it. The SNES versions were fine in the mid-90s (alpha 2 ... Less than fine) but nowadays this is pretty lame. @Manjushri i was just thinking the same thing. Does Nintendo have any arcade emulation on VC? Because they should. The Wii U is more than capable. Not sure about the 3DS but i would think so as well. From what I recall the CPS was just slightly beefier then the 16-bit consoles of the day and nothing too difficult to emulate. @brandon9271 I don't buy the "not powerful enough" bits about any modern handheld/console and emulation of games like these. I was using CPS-2 emulators on my Windows 95 compaq fifteen years ago. I think these companies are just too lazy to program and too proud to license out to those who have already developed the emulators. @Olmectron American here. I remember no deals with the first three games. They were all just full price. We've not gotten deals on any SNES games, to my knowledge. @Ralizah Clearly you didn't read my comment well, or you didn't own a Wii U in 2013. My comment was about the Wii U's VC. The N3DS hasn't gotten any SNES VC discounts as you say, but read my comment again, I never said it has. On August 22nd, 2013, the Wii U VC got the three SNES Street Fighters games. If you bought one of them for $7.99, the other two were half the price, so with only 16 dollars, you were able to buy the three of them. Was Alpha 3 ever released on anything other than the GBA and PSP? Alpha 3 naturally has more characters than Alpha 2. SF2 Turbo is the more loved version as its the one most people owned, & was a significant upgrade from vanilla SF2. Heck, it was the reason I personally bought a SNES , having always been a Sega fanboy. However, as a newcomer with no nostalgia to factor in, Super SF2 is definitely better as it is more balanced & added 4 more playable characters. If we are talking non-SNES related versions, the best iteration of SF2 is Super SF2 Turbo, by MAME, PC-CDROM or Sega Saturn. It's much better, but never made it to SNES. SF Alpha 2 is a completely different game from the ground up - the Alpha series is a subset of games, made after, but set before SF2. IMHO Alpha 2 is significantly better than Alpha 1 & 3, and is probably the best SF game period. However the Alpha games were much more suited to 32bit technology (with the Saturn version being the best by a long way) and the SNES version is a very watered down experience. I'd play it on MAME or Saturn TBH. TLDR: Out of these 3 SNES games, get Super SF2. @Manjushri this was just a quick ROM injection to make a buck. They'll milk this dry and then put out an arcade version to "double dip" and get more money out of SF fan. After that we'll no doubt see the HD remakes. Emulating CPS2 would be no problem for 3DS. Even PSP handled that fine. But there are still good reasons to take a console port over an arcade version, such as more modes and options, as well as toned down CPU routines. As for picking between Turbo and Super, I think Turbo is the better pick. I didn't like Super's 4 new characters or their stages. I also didn't like the audio changes.